Build a better landscape business by attending the Landscape Management Workshop and let us help take your business to the next level. Leave your tools in the shed for the best two days you’ve ever spent working on your business! 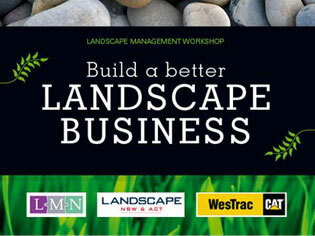 Brought to you by Landscape NSW & ACT (LNA) in partnership with WesTrac, this hands-on workshop is just what you need to keep your business growing. Run by landscapers for landscapers, the workshop will provide you with knowledge, resources and tools to make immediate improvements, and help you increase your business efficiency, productivity and profit. The workshop is designed to give you the confidence and inspiration you need to effectively manage your business. Register online today to secure your spot at the workshop – hurry, numbers are limited!